The entire month of April marks a huge celebration for US military schools and bases all across the country. Back in 1986, Department Secretary Caspar Weinberger established the entire month of April to be deemed as “Month of the Military Child.” This time is dedicated to acknowledging not only the hardships and trials, but also endurance and strength that military children display. So, this month let’s focus our attention and appreciation towards the little ones that show the most bravery through their sacrifice on the home front. I was given the opportunity to talk with an amazing military spouse and her boys about their personal experiences of struggle and triumph while growing up military. 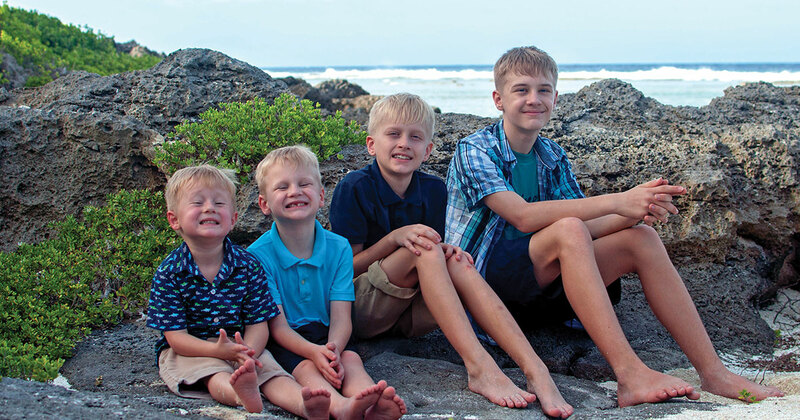 Carrie Jennings is eleven years into her parenting journey raising her four boys Ryan (13), Levi (10), Rhys (6), and Liam (3). Being a fellow military spouse and a new mom myself, it was an honor to learn their stories while also truly insightful to view this journey from the children’s perspective. They helped paint a real picture of what they actually experience while navigating through military life. Eleven years ago, Carrie and her husband made the huge life altering decision for him to join the military. At the time Ryan, their oldest, was only three years old. “We didn’t give much, if any, thought to the challenges of raising a family in the military lifestyle. Of course, we didn’t know where we were going, but we were excited for the possibility our children would do more and see more than we did growing up.” This statement alone is a true testament to the life that military children get to experience. But even though there are some incredibly amazing opportunities that come along with growing up as a military child, there are also many challenges to combat. Perspective such as this is priceless. The Jennings boys have learned the art of seeing the best in things and enjoying wherever life might take them. This is a golden lesson that will inevitably stay with them throughout their entire lives. All thanks to Carrie and her husband’s selfless act of service to our country. Thank you to Carrie’s husband for your service. Thank you, Carrie, for your service. And this month most of all, thank you, Ryan, Levi, Rhys, and Liam, for your incredible service and endless sacrifices that you make for our country every day.